New Delhi: The Russian government is holding up India’s request for a stake in Sakhalin-3 crude oil until contractual disputes and bribery probes into Technoprom Exports and Power Machines over supply of boilers to NTPC Ltd are resolved. 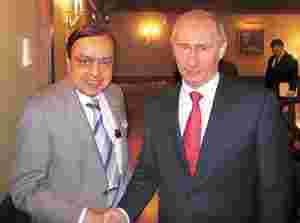 This position was communicated in no uncertain terms by Russian Prime Minister Vladimir Putin during petroleum minister Murli Deora’s early November visit to Russia. Work on the project, already behind schedule for two years, has virtually come to a standstill following contractual disputes between NTPC and Technoprom, with the Russian supplier demanding more money for the equipment, citing higher steel prices. Complicating matters is a probe involving CBI as well as Interpol over alleged bribes paid for the boiler supply contract through an offshore transaction, which was first reported by Mint on 17 June. The CBI is yet to submit its probe report to the government and Mint couldn’t ascertain what was holding up the findings. Questions emailed to Technoprom weren’t immediately answered. Anil Razdan, India’s power secretary, would only say: “The issue is before the adjudication. Let us see what happens. You need to check it with chairman and managing director of NTPC." R.S. Sharma, NTPC’s chairman and managing director, declined to comment. NTPC is India’s largest power generation company with a capacity of 29,144MW. The delay in the Barh project will affect its plans to raise the total capacity to 50,000MW by 2012. India, the world’s fifth largest oil importer, is hoping to get a share of the Sakhalin-3 crude. “We want stake in Sakhalin-3 as the crude from there is very cheap to produce. It is a good opportunity. We would be happy with any stake but 20% looks good. We have communicated our interest in acquiring stake in Sakhalin-3 to them and we are trying to resolve the issue raised by them," the same petroleum ministry official added. India already has a 20% stake in Russia’s Sakhalin-1 through state-owned ONGC Videsh Ltd (OVL), a subsidiary of the Oil and Natural Gas Corp. Ltd. Exxon Neftegas Ltd is the operator that runs the Sakhalin-1 block, which is owned by a consortium of Exxon Mobil Corp. (30% stake), Sodeco of Japan (30%), Russia’s RN-Astra (8.5%) and Sakhalinmorneftegas-Shelf (11.5%) and OVL (20%). “Controversies regarding Technoprom and other Russian suppliers have been dragging on for long and probably it will be good for the government of India to settle it along with acquiring the Sakhalin stake. Hopefully, this will not mean too much of a raw deal for NTPC and its customers," said Anish De, chief executive at Mercados Asia, an energy consulting firm.